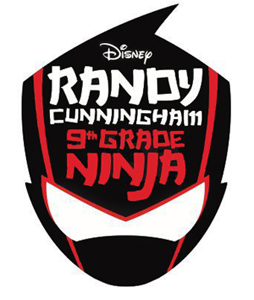 Randy Cunningham: 9th Grade Ninja is an animated action/comedy series on Disney XD by Titmouse Inc. (Motorcity) and Boulder Media (Foster's Home for Imaginary Friends). Norrisville High School is a frequent target of monsters, robots, and bullies. For years, the student body has been protected by "The Ninja". At the start of his freshman year, the unlikely Randy Cunningham is chosen to be the next Ninja. Joined by his best friend Howard, Randy must protect the school from the likes of monsters sent to destroy him by the evil McFist Corporation as well as keep his new identity a secret. SO much better than it sounds. If the character designs are familiar to you, chances are you've seen Invader Zim, since they were designed by Jhonen Vasquez, and the series' general art style takes on a lot of his influence. Ended with very little fanfare in 2015 after Disney XD burned off the remaining episodes of Season 2. Aborted Arc: Everything surrounding the Sorceress was pretty much forgotten after the episode "Sorcerer in Love 2". It seems like, in fact, the character itself was dropped, since she is never even mentioned again as of the end of Season 2. A Birthday, Not a Break: Played with in Julian's Birthday Surprise, where Randy and Howard go to Julian's birthday party and unintentionally cause chaos because Julian mistakes the sorcerer orb that Randy brought with him for a birthday present. Absurdly Sharp Blade: The Ninja Sword can cut through anything... but stupidity. Adorkable: Randy and Howard, but especially Randy. A Day in the Limelight: Howard in The Ninja Supremacy when he substitutes for an amnesia struck Randy until the end when Randy has regained his ninja memories. Accidental Misnaming: Heidi does this most of the time to Randy. She called him Sandy, Andy, Brandy, etc. Hilariously, she is Howard's sister. Heidi: ...and his best friend Andy. Randy: Randy, name's Randy, known you my whole life. Though in Debbie Meddle, Heidi finally said his full name right. In the end of the episode, she only remembers his first name, but mispronounced his last. Accidental Public Confession: In "McOne Armed and Dangerous", the Ninja tries to expose McFist as a villain during a ceremony but, since McFist isn't up to anything evil at this moment, he manages to preserve his reputation until the Ninja's efforts cause a commemorative statue to be destroyed and the first McSquiddle to be lost, making McFist to furious to remember he's in public and he ends up blurting his true purposes. Affectionate Parody: Jackie Cous, an artist for the show, has said the show "doesn't take itself seriously and pokes fun at a lot of the tropes and cliches, rather than falling right into them un-ironically." All Part of the Show: In Grave Puncher: The Movie!, everyone assumes that a giant version of the Grave Puncher coming to life and attacking everyone is part of the movie. All There in the Manual: You can learn more of the story if you play the game "Enter the Ninjanomicon" . Artistic License  History: Done deliberately because the show doesn't take itself seriously. Norrisville is somehow 800 years oldnote far older than European settlement of the Americas, and a flashback in Sorcerer in Love shows that it was somehow culturally Japanese back then, but inhabited by mostly white people. Art Shift: The Ninjanomicon is in a sort of traditional Japanese cut-out style, while Randy stays in the usual style even while in the book's world. As You Know: Randy and the viewers learned about Terry McFist (Hannibal's big brother) being the real heir to McFist Industries and yearly signing over the company to Hannibal when he overheard Viceroy reminding Hannibal of that fact. Ascended Fanboy: Randy was The Ninja's biggest fan in middle school, and now he has become The Ninja. Asteroids Monster: The mutant potatoes from Attack of the Killer Potatoes. Cutting them just multiplies them as Randy found out and he had to use Viceroy's robot to mash the potatoes to defeat them. Attack the Tail: Randy does this twice in Viva El Nomicon to destroy two monsters. However, the second time played straight into Viceroy's hands (see also Bears Are Bad News below). Attack Its Weak Point: The only way to "destank" someone, is to destroy the thing they hold most dear (mostly a item of some kind), it's the only way to free them from their monster state. Fortunately for Randy, the monsters tend to have the item on them after they were stanked. Can also become a bit of a difficulty curve if the dearest possession in question is something abstract such as a relationship or winning streak. As of True Bromance, it's also possible to destank someone if the conflict is resolved through some sort of apology to those wronged. This is also how Randy avoids having to slice Howard in half. Attention Deficit... Is That a Choco Fountain?! Battle of the Bands: Briefly, in Unstank My Hart. Bears Are Bad News: In Viva El Nomicon Randy fought a Mexican Death Bear. Debbie Kang thinks they are cute though and even dresses-up as one on Halloween. Becoming the Mask: Randy in Brolateral Damage, when he tries to get information about the mysterious BBD plot. The Ninjanomicon even warns him about this. Of course, Randy doesn't pick up on it at all. Bee Bee Gun: in the form of the Ninja Bee Ball. Berserk Button: The robo-apes actually have a built in one. Viceroy's Evil Genius really comes to the surface when he's without Otto. Better the Devil You Know: In the episode featuring Hannibal MsFist's brother Terri, the Ninjanomicon lampshaded the trope by bringing up the possibility of the unknown ally being more dangerous than the known enemy. In an episode where Randy outs McFist as a villain, he ends up having to restore his reputation as Hannibal's stank'd form brought about by his distress is far too powerful for Randy to defeat. Big Bad: The Sorcerer, for the overall series, though he gets some competition in season 2 in the form of Evil Julian. Blind Black Guy: S.Ward Smith the metal shop teacher. He still able to craft some amazing swords and can make surprisingly balloon swords. Brain Bleach: A main plot point in the episode "Gossip Boy" is Randy's attempts to find a mind-wiping spell in the Ninjanomicon, his original reason being to apply this to the more "shnasty" memories of things he's seen while doing duty as the Ninja. Brain Uploading: While it does have written words, the Ninjanomicon puts Randy into a drooling state and spells out a somewhat cryptic answer to whatever question he asked but likes to do so by throwing him into a sort of surreal world inside the book. When a Ninja's duty is done they "learn" the "Ultimate Lesson", in which they upload everything they've learned into the Ninjanomicon for future Ninjas to learn. Randy: [Debby Kang's] whole report was in Spanish, so she may have been giving a flan recipe. Howard: (looks directly at the screen) Man, how good is flan? The entire episode of Debbie Meddle. During the end of "Fudge Factory", Randy was looking at the screen while explaining the consequences of lying. Broken Win/Loss Streak: Norrisville High's Chess Team has defeated Flackville High's eleven times in a row. When they tried the twelfth time, Hannibal McFist replaced one of Flackville's players with a robot that broke that streak, making several Norrisville students depressed enough to be stanked by the Sorcerer. The students reverted back to normal when Howard Weinerman, who knows practically everything about chess except for the pieces' names, defeated the robot. Blatant Lies: In Wave Slayers, the Ninjanomicon, when Randy asks it about what he should do after breaking one of the team's vehicles, doesn't give him a cryptic answer as per usual, but very clearly tells Randy to own up to his mistakes. Randy, however, pretends not to understand. Blob Monster: In Monster Dump, they start off harmless, but then get deadly later on. The only one that stayed harmless was Nicholas. Bystander Syndrome: The Ninja of '85, instead of curing Dickie, he froze Stanked!Dickie to attend prom instead and leaves the problem for a future Ninja (Randy) to deal with. The Cameo: There's been a strange orange-haired man with a fedora hat since #1, who is implied to have given Randy the Ninja suit and Ninjanomicon. You have to be really looking to spot him in every episode. Calling Your Attacks: More of Randy's choice rather than anything else. Also taken Up to Eleven in that he calls out everything. "Ninja Sprint!" "Ninja Stop Ninja Stop Ninja Stop!" "NINJA FLIP!" "Ninja Rotating-Table-Slide!" Cassandra Truth: Randy knows Hannibal is an enemy, but due to the public being useless in connecting two-and-two together, Hannibal says nobody will believe the Ninja. In McOneArmed and Dangerous, the trope was subverted. It did take a while before anyone believed him though, to be fair. Later, it's inverted again, back to everyone thinking Hannibal's the best. Cast of Snowflakes: Each character has a unique character design. Even the background characters too. Chekhov's Armory: Randy uses several of the weapons, attacks, and lessons he's accumulated over the course of the first season to fight the Sorcerer in the 13th Century. He fails. Clothes Make the Superman: The Ninja Suit. Cloudcuckoolander: Randy is definitely more than a bit odd and spastic, though he is often Closer to Earth than his best friend Howard. Counting to Potato: Randy hides the Ninjanomicon under a math book cover that reads "easy as 1-2-C". Crazy-Prepared: What kind of Mad Scientist would Viceroy be if he didn't have a killer robot with him everywhere he goes? "Could Have Avoided This!" Plot: The solution to many episodes' problems or completely avoiding the problem in the first place are almost always presented to Randy by the Nomicom. Randy, almost every single episode, comes up with an extremely roundabout interpretation of the Nomicom's advice that suits his desires. This is especially egregious in that the Nomicom's advice is almost always far clearer than that of similar objects throughout much of fiction. For instance, one episode involves Randy going on vacation to a resort island that keeps an eye on the guests' pulses. If they get too stressed out, they get catapulted back to the mainland. Randy gets very close to getting kicked off more than once when he runs into McFist, who is there in order to relax with his wife and not be evil for once. The Nomicom's advice can be summed up as "Don't poke the bear." Randy comes to the conclusion that he is the bear and gets McFist kicked out of the resort, which naturally sets McFist off. It's also indirectly implied that Randy is aware of this. At one point he and Howard think it would be cool to set free some animals taken from Detention Island that are being used as sideshow attractions by McFist. They are genuinely surprised and excited when the Nomicom tells them in plain terms that this is a good idea. Things only go south when they decide to keep the animals in Randy's garage as pets. In Ninjaception, Randy is caught in a Lotus-Eater Machine and thus cannot consult the Nomicom as he usually would. The season two finale has the Nomicom suggest to Randy that an unlikely ally is the key to defeating Evil Julian. Randy assumes that the Nomicom meant Howard. Nobody can blame him for not even considering the Sorcerer as a potential ally. Creepy Cemetery: There's one in Night of the Living McFizzles. Complaining About Rescues They Don't Like: McFist when the ninja stop the Shark-Dermanator from killing him and Viceroy and sending it back to the lake to sleep. Randy: Wait, I'll pay for saving your life? Viceroy: You gotta give it to him baby, he's consistent. Continuity Nod: Randy still has the Healing Hands as of Silent Punch, Deadly Punch. As a whole the show seems to be pretty good with obeying its continuity. The Corrupter: The Sorcerer stanking people count as this. Corrupt Corporate Executive: Terry McFist fears to become like this like his father and brother. Cuteness Overload: How to defeat the Halloweenja's army. Dance Battler: So U Think U Can Stank gives us this in the form of Stank'd dancers. It proves to be a double edged sword, however, as their thing held most dear WAS their dance moves. Randy simply trips them for a De-Stanking. In Everybody Ninj-along Randy... Well, he Ninj-alonged. Darker and Edgier: Nukid on the Block. If Howard hadn't stepped in and helped, McFist would have won. In Fudge Factory it was pure luck that the Ninja went on to live another day. In Stanks Like Teen Spirit, so much chaos was caused that The Sorcerer nearly escaped. In 13th Century Ninja he did. The show is definitely, gradually edging towards this, with the villains becoming smarter, the stakes higher and Randy seemingly not progressing in his smarts as fast as his enemies. However, everything's still pretty goofy. Delinquent Hair: Randy, in Brolateral Damage. Demonic Possession: Howard was possessed by the Tengu. Perhaps Catfish too, in Welcome Back Catfish. Deadpan Snarker: Viceroy is pretty much in permanent snark mode, especially around McFist. Devil in Plain Sight: Hannibal McFist is this to the general public, who in turn adore him a lot for being the head of the city's major consumer products company. It's incredible how everybody ignores the right cyborg arm with a brain with eyes on the wrist. That is SO TOTALLY not evil-looking, oh no! Didn't Think This Through: In The McHuggers Games, the Ninja stole a McHugger from Hannibal McFist before the product was available in stores. Knowing the Ninja, like every other townsperson in Norrisville, would be attracted to the publicity event created to advertise the McHuggers, Viceroy sent a robot to the event and programmed it to attack whoever was wearing McHuggers, thinking the Ninja would be the only one. He forgot that, given the publicity campaign's goal, the spokesman would be wearing one as well. Distaff Counterpart: The Sorceress to the Sorcerer. They're apparently boyfriend and girlfriend, though, a certain Ninja did wonk things up for them, causing them to be separated nearly all the time. Distressed Dudes Both Howard and Randy respectively. Makes sense that while Howard was the primary dude in distress in a lot of episodes (both older and recent episodes), Randy is slowly becoming this in the more recent episodes since the show itself is getting darker and edgier. The Dragon: Hannibal McFist to The Sorcerer. Dumb Jock/Popular Is Dumb: Bash doesn't have a whole lot going on upstairs. Ear Worm: In-universe, the theme song of Whoopee World (which kind of sounds like the Six Flags theme "We Like to Party" with the words "whoop and whoopee"). Egg Sitting: Except it's a bologna. Eldritch Location: The Land Of Shadows. Epic Fail: Randy's first attempt at fixing his sword. Not even a blinder clip, duct tape, stamps, bandaids, cement, paper clips, and string could keep it together. Eskimos Aren't Real: Howard Weinerman doesn't believe isosceles triangles are real. Everything's Deader with Zombies/Our Zombies Are Different/Technically Living Zombie: In Night of the Living McFizzles they are not really dead but look like it and they crave candy. Everything's Better with Samurai: One of the Stank'd monsters forged his own samurai armor to protect itself. Evil Brit: Levandar Hart when he's stank'd. And famous. Mostly when he's famous. In fact, quite possibly, only when he's famous. But he's also only famous when he's stank'd. Evil Genius: Viceroy. And Driscoll. Evil Tower of Ominousness: The McFist Corporation has a rather foreboding structure set up in the middle of the city. Though personally it looks more like a futuristic pyramid than a tower. Fan Disservice: The Sorcerer in "Brolateral Damage." He is seen wearing a towel and at the end of the episode, the towel drops offscreen with the Sorcerer's rat companion making a disgusted reaction, implying that it got an eyeful of the Sorcerer's genitalia. Fat and Skinny: Howard and Randy respectively. Final Battle: In Randy Cunningham and the Sorcerer's Key Randy and Howard learn from the Nomicon that the final battle with the Sorcerer is approaching. Naturally, Randy is freaked out. Fish out of Temporal Water: Dickie, who was from '85, was unfrozen in the present day. Foreshadowing: At the end of the finale episode, some of the sorcerer orbs scattered, with one being found by Catfish Booray. In Sorcerer in Love 2: Sorceress's Revenge, the Land of the Shadows makes its first appearance. It seems to be a throw-away plot device though. Until it reappears in Julian's Birthday Surprise. As of All the Juice that's Fish to Swim, Debbie Kang is trying to find out who the Ninja is. For Halloween, I Am Going as Myself: In Dawn of the Driscoll, Randy is able to sneak into McFist's house... because McFist thinks he's just a kid trick-or-treating dressed as The Ninja. Forgotten Birthday: Randy forgets about Howard's birthday in Space Cow-Bros. He tries to make up for it by lying every time when Howard asks about his surprise party or gift. Freeze-Frame Bonus: This show is really big on sight gags, most notably with the neon scribbles that appear, but also try pausing to see how much Randy and Howard spent on McFist Industries items next time you're watching McFists of Fury for absolute hilarity. Freudian Excuse: Doug decided to become a tattletale back when he was six years old and Marci berated him for not telling her on Randy and Howard as soon as he saw them sneaking out of her day care center. Full-Name Basis: Randy and Howard both call Debbie Kang by her whole name when they mention her. Gasshole: Ironically played with, since the robo rhino scans then farts a conjuring of your worse fears. McFist lampshades this by saying it feels like a cheap gag. Then theres McFist older brother wind power idea. Godzilla Threshold: Freeing the Tengu and allowing it to possess Howard so that Randy can control him with the suit. Randy refuses when Howard asks him never to do it again, implying it may be needed in the future. Good Is Boring: Howard asks Randy why he (Howard) can't be the nice judge in So U Think U Can Stank. Two seconds later, he laughs at it with Randy. Great Big Book of Everything: The Ninjanomicon. It has all the accumulated knowledge of all previous Ninjas. Gym Class Hell: While Coach Green thinks his lessons are great, with his strange ideas for activities like flamethrower jump-rope, most of his students do not agree. Gym Class Rope Climb: The plot of The Tale of the Golden Doctor's Notes is how to get out of Coach Green's version of it. Halloween Episode: In order, Dawn of the Driscoll and Night of the Living McFizzles, taking place right after one another on, presumably, the same night of Halloween. Handbag of Hurt: A giant, killer robot made out of satchels to be precise. Happy Flashback: The Sorcerer had this in Stank'd to the Future to the 1985. It just showed him sitting annoyed in his prison, as a different rat did the moon walk. Hannibal McFist had one in McOne Armed and Dangerous. It was similar to the one Anton Ego had in Ratatouille. Hero with Bad Publicity: Averted, due to the ninja being a protector of the school and by extension the town for 800 years, the ninja is practically a celebrity in the eyes of the townsfolk. Healing Hands: Deconstructed. Randy learns to shoot healing beams out of his palms, with knowledge obtained from a forbidden section of the Ninjanomicon, leading him to accidentally reanimate the skeleton of an evil mad scientist. Henshin Hero: Randy becomes The Ninja by putting on the mask of the suit, complete with Transformation Sequence. Heterosexual Life-Partners: Randy and Howard, obviously. Perhaps less obviously, Hannibal and Viceroy. Highly Visible Ninja: The Ninja operates in broad daylight and has been a highly regarded public figure for years. Hollywood Chameleons: Possibly subverted, seeing as they were robots. How Is That Even Possible? : In a Halloween Episode, the reanimated skeleton of Jerry Driscoll is recognized by a retina scan in spite of, as Viceroy points out, not having a retina. Human Popsicle: Stanked!Dickie was frozen by the Ninja of '85 and awoken in present day when the power to the school freezer was cut. I Am A Humanitarian: Subverted Catfish Booray isn't going to eat Howard, His brainwash animal army will. I Am Spartacus: How Howard foiled McFist's and Viceroy's plan using the Truth Tone to find out who the Ninja is in 30 Seconds to Math. Improvised Weapon User: Randy seems to be a fan of this trope when he does not use the weapons in the suit. Ink-Suit Actor: Debbie Kang and Coach Green bear some resemblance to their respective voice actors. Invisible Parents: With the notable exception of Hannibal McFist and his wife Marci, we don't see any parent in at any moment (unless you count Bucky's mother). In fact, Randy's parents are not seen in at any moment, although he names his mom sometimes. We finally can see Mort Weinerman, Howard and Heidi's father, in Season 2. Is This Thing Still On? : In "McOne Armed and Dangerous", the Ninja's efforts to denounce Hannibal McFist during a public event would have been in vain if not for this trope. Jerkass: In So U Think U Can Stank Howard acts like this a few times, but he becomes popular when exploiting it while being a judge in the school's talent show. Randy was the one to suggest this to him, and it inadvertently makes every single downcast participant turn into hideous monsters for Randy to fight behind the curtains. Ninja Pirate Zombie Robot: A stanked Scorpion centaur robot. Kamehame Hadoken: The Ninja Air Fist. Kick the Dog: Viceroy and McFist were jerks to that Shark Kaiju with the dry skin. Kid Hero: Also see Affectionate Parody above. Later deconstructed, as at least one of the past ninjas has abused his power. Mac Antfee, the ninja of 1985, locked a kid in a freezer rather than destank him so he could have time to go to prom. This resulted in the kid being trapped in monster form for over 20 years. He was also extremely violent, resulting in the Ninjanomicon having to expel him of its abilities so he couldn't abuse it any further. Kill It with Fire: The weakness of the Blob monster in Monster Dump. Lame Pun Reaction: This one after Viceroy shows McFist the zombie making candy. Viceroy: Congratulation, you created a confection of mass destruction. McFist: (gives annoyed look) Proud of yourself for that one? Randy: Well, I guess you have to know the difference between your Franz and your enemies! Howard: Too soon, Ninja. Too soon. Large Ham: "I NEED! TO USE! THE BATHROOM!" Laser-Guided Amnesia: Randy spends most of Gossip Boy searching for a "Mind Wipe" in the Ninjanomicon. There isn't one that can be used. Only a piece of wisdom, "The way to forget, is to remember". Howard pretty much exclusively calls Randy by his last name. Hannibal McFist is called by his last name by everyone except his wife and his brother. Sometimes by Viceroy as well. Viceroy is always referred to by his last name. According to Dawn of the Driscoll and the "Enter the Ninjanomicon" game, his full name is Willem Viceroy III. Legacy Hero: Every four years a new ninja is chosen to protect Norrisville High. Losing Horns: A running gag is that the trombone player for the marching band will pop up, and play a Type B when something bad happens. Made of Evil: The Sorcerer orbs, which also seem to have some connection to the Land Of Shadows. Mad Scientist: Both Jerry Driscoll and Viceroy. There's even a university for mad scientists. Magic Knight: The Ninja; intense melee skills and weaponry along with mystical Elemental Powers and Ki Attacks. Mask of Power: The Ninja mask, creates the suit. MacGyvering: "All I need is some chewed gum, a pencil, and that thing Flute Girl plays." Mecha-Mooks: Robo-Apes are this to McFist, though we see them doing a multitude of things, including fighting The Ninja and catering McFist social events. They even have their own King Mook in the form of one having a built-in mohawk. Mistaken Identity: In Bash Johnson: 11th Grade Ninja, Bash is mistaken for the ninja and gets all the adulation and is almost killed by McFist's robo-apes. During Randy's first run-in with Catfish Booray, Randy introduced himself as "Reginald Bagel", leading Booray to believe that to be the Ninja's true identity. It's revealed in a later episode there is a boy named Reginald Bagel and the Ninja has to protect him from McFist. Monster of the Week: Alternates between McFist and Viceroy's mechanical monstrosities and The Sorcerer turning people in despair to monsters. Mook Maker: Randy actually get this one, in the form of Earth Attack. At first it went kinda wrong as Randy accidentally created a monster sandworm but played straight with the Sandja's. Multi-Armed and Dangerous: The Krakenstein. Naked People Are Funny: Bucky at the end of Got Stank? Names to Run Away from Really Fast: You wonder how most everyone in Norrisville doesn't suspect someone named Hannibal McFist is evil, though that might be part of the joke since it is lampshaded. Nice Job Breaking It, Hero! : Escape from detention island is like one HUGE showing of this trope. When Mac Antfee returns, he's a motivational speaker and becomes nice, Randy believes it's an act and reminds Mac of the ninja mask with all it's cool weapons, powers, and the Nomicon, causing Mac to turn back to his old self while practically exposing himself as the ninja. Randy also accuses the Nomicon of doing this for not mind wiping Mac when it fired him as the ninja. Those pale in comparison to when Randy and Howard broke into McFist's Time Machine and went back in time to the day the original Ninja imprisoned the Sorcerer. They altered the past, freeing the Sorcerer. And Mc Fist wasn't even planning to use the time machine to do anything to harm the Ninja and / or free the Sorcerer. No Indoor Voice: McFist seems almost entirely unable to keep himself from yelling. About anything. No Name Given: Several recurring characters have no name. A notable example if Flute Girl. Noodle Incident: How Jerry Driscoll became a skeleton. Heidi: Wonk this up, and I will webcast that video of you two taking a bath together! Not What It Looks Like: In-universe, there was a misunderstanding with a student named Becky when she was only just bloated. Of course, there have been other incidents of "It's not what it looks like" in-universe... But the above example is the most notable. Obnoxious In-Laws: Marci's mother to McFist. Only Known by Their Nickname: Even science teacher Mrs. Driscoll calls the girl who plays flute in the marching band "Flute Girl." Overly Long Tongue: Bash suffers this in "Best Bud" due to one of the Viceroys inventions literally turning his tongue into a huge squid monster. Pirates Versus Ninjas: In Club Ninja-dise; McFist, Viceroy and marauder bots as the pirates vs. the Ninja Randy Cunningham. Pungeon Master: Jerry Driscoll sure loves his skeleton puns but somewhat understandable since he's a living skeleton at the time. Ragin' Cajun: Catfish is definately this. Red Right Hand: Hannibal McFist has an artificial arm that seems to have a mind of its own. Literally, you can see parts of a brain inside of it. Red Shirts: Mac Antfee has an army of these (though they're technically Mooks), they're even called that. Ripple Effect-Proof Memory: When the Sorcerer's past was altered and his eight-century-long imprisonment erased, he still remembered it. Later, when Randy and the original Ninja imprisoned the Sorcerer back in the 13th century, Present-time Sorcerer didn't forget his brief freedom. Right for the Wrong Reasons: In Bash Johnson: 11th Grade Ninja, a de-stanked student thinks Bash was the one who turned him back to normal because he thinks Bash is the Ninja. He's wrong about Bash being the Ninja but is right about Bash being the one who turned him back to normal. Rockers Smash Guitars: In 30 Seconds to Math, Howard does this to his sister Heidi's guitar; he does this to smash the Truth Tone which also inadvertently disqualified Heidi from the Battle of the Bands by lack of instrument. Bash also jumped on his turntables, presumably for the same reason. Running Gag: Just about every time Randy uses the Nomicon, he either gets hit on the way down or drools. The Principal's car is destroyed nearly every episode. Sadist Teacher: The gym teacher is either this or just insane. Case in point, he wanted the group to play a sport he invented that involved a flamethrower. Scarf Of Asskicking: It even doubles as both a rope and a whip! Secret Identity: Randy has a hard time grasping this concept. Secret Keeper: Howard is the only one who knows Randy is the Ninja. Sensory Overload: When Randy asks for some super taste to cheat in a blind taste competition, the Nomicon gives it to him. Along with jacking all his other senses up to agonizing levels as punishment for cheating. Sequel Hook: The end of "Randy Cunningham: 13th Century Ninja" foreshadows a new threat in Form of the Sorcerers Power Balls. Season 2 ends with one as well with the Chuck Norris Expy proclaiming Randys real fight has just begun. Shadow Archetype: Mac Antfee was the '85 ninja, and although he had some skill like Randy, he had none of Randy's good qualities, like how Randy tries to make up for his mistakes and stop monsters at personal cost. In fact, Mac was essentially fired, and he wanted revenge. Share Phrase: Randy likes using the Catch-Phrase "What the juice?!" so much that other characters eventually say this. He has a number of other Catch Phrases in the form of odd euphemisms and lingo, such as "that's the cheese" (that's the best), "so honkin' bruce" (that's freaking awesome), "shnasty" (extremely gross), and "so wonk" (so lame). The fandom likes using these a lot too. Between Randy and Theresa, several times throughout the first season. Less so in Season 2, but it is still there. More subtly between Randy and Heidi at the end of Grave Puncher: The Movie. A bit between Randy, as the Ninja, and Debby Kang. Norrisville, as in CHUCK NORRIS?! Also the previous Norrisville Ninja looks like Chuck Norris. The Last House on the Left: The pilot episode is titled "Last Stall on the Left". Clash of the Titans: Release the Krakenstein! Seven Samurai: Randy has a vanity license plate in his room that says 7SAMURAI. "Got Milk?" for the title of Got Stank?. In Gossip Boy the Robo-Apes' mugs say "Got Crude?" So You Think You Can Dance: The title of So U Think U Can Stank. Fist of Fury: The title of McFist of Fury. Gossip Girl: The title of Gossip Boy. Monster House: The title of Monster Dump. Attack of the Killer Tomatoes! : The title of Attack of the Killer Potatoes. House of 1000 Corpses: The title of House of 1000 Boogers. Skittles: "McSquiddles! Lick the Lightning!" Tale of the Golden Doctor's Note has a scene where Randy and Howard rush to save Julian from a trap, shown to be much like the original arcade Donkey Kong game in design. From the same episode, Randy's trick to the rope-climbing exercise mirrors a similar scene from the Kickin' It episode "Kickin' It Old School". The episode as well as Randy and Howard's band 30 Seconds to Math are named after the band 30 Seconds to Mars. Dawn of the Dead (1978): The title of Dawn of the Driscoll. We hear Viceroy complaing about a dumb kid in the pumpkin patch waiting for something as he watches TV. Peanuts Halloween special, anyone? Hannibal McFist's older brother Terry dresses a lot like The Dude. Night of the Living Dead: The title of Night of the Living McFizzles. One of the zombies is dressed up as Michael Jackson from Thriller. At one point, Randy, Howard, Theresa and Debbie Kang walk down Elm St. The house Theresa and Howard hide in is a exact copy of the Bates House in Psycho. The scene with the creepy twins in the hallway is lifted directly from The Shining. Silent Night, Deadly Night: The title of Silent Punch, Deadly Punch. Back to the Future: The title of Stank'd to the Future. Howard calls Randy "dilweed", a catchphrase that Brad uses from Kick Buttowski. The Van Dam, named for Jean-Claude Van Dammenote In-show it was named for it's creator. The Van Dam's creator's name is Victor Van Dam. That name is similar to Victor Von Doom. Ratatouille: The Happy Flashback Hannibal McFist had when he ate a meat-flavored McSquiddle. Phineas and Ferb: One of the background characters looks extremely similar to Candace. There is even a shot of her screaming in a Candace-like way. Toni Braxton's song "Un-Break My Heart": Unstank My Hart. Howard's hair resembles Super Saiyan from the anime series Dragon Ball. "Weird Al" Yankovic's "My Bolonga": "M-M-M-my Bologna". Randy and Howard's baby's (or bolonga)name is Sylvester Balone, who is named after Sylvester Stallone. Gravity Falls: The board that Debbie used to pinpoint the ninja in Debbie Meddle is similar to Dipper's board. He-Man and the Masters of the Universe (1983): Rorg: A Hero of a Past. When Harry Met Sally...: When Howie Met Randy. Doug's drawing looks like Courage from Courage the Cowardly Dog. The Notorious B.I.G. 's song "Mo Money Mo Problems": Bro Money Bro Problems. The Three Musketeers: The Three Mascot-teers. The robot from the space shuttle is similar to the Queen from Aliens. The Fresh Prince of Bel-Air: The Fresh Principal of Norrisville High. The plot was a parody of The Matrix. Nick Fury: In Bro-ing Down the House, Viceroy tells Randy and Howard that it's not his first rodeo. In episode "Mccluckerbusters", the factory of PJ Mcflubbusters looks like from Willy Wonka & the Chocolate Factory. Big Troublein Little China: Big Trouble in Little Norrisville. Sick and Wrong: These types of events happens and Randy usually responds with "Shnasty." Sick Episode: Subverted in Randy Cunningham's Day Off. Sitcom Arch-Nemesis: Brent, S. Ward Smith's apprentice, is apparently this towards Howard. Skewed Priorities: Averted. A teacher wasn't gonna let Randy get his backpack during a drill. Even if he's standing very close to it. Played straight in "Randy Cunningham: 13th Century Ninja", out of fear McFist was implementing another evil plan, Randy and Howard decided to sneak away from the tour at McFist Industries. When a student reported them to Principal Slimovitz, Slimovitz ignored them and had the other students do the same and keep their eyes on the "tattle-tale" because he hates tattle-tales more than he hates troublemakers. Not knowing it'd somehow result in the Sorcerer being free does not excuse him. Slow Clap: Howard (and Randy) received one in Gossip Boy. Spit Take: In Gossip Boy, Randy did this when Howard mentioned that he knows who the Ninja is live on Heidi's blog show. Squee! : Debbie Kang's reaction when finding out there's a Mexican Death Bear at school. Also Rachel. SO MUCH RACHEL. Status Quo Is God: In "McOne Armed and Dangerous", Hannibal McFist's status as a Villain with Good Publicity is destroyed thanks to the Ninja telling the people about McFist's attempts to have him killed and McFist falling victim to Is This Thing Still On?. The Sorcerer then Stanks McFist. After McFist is brought back to normal, the Ninja decides to restore his reputation by claiming McFist only tried to kill him because he had been turned into a monster. It happened to so many students before everyone in Norrisville bought that and called off the boycott on McFist Industries. Sure, Let's Go with That: Hannibal McFist once tried to destroy the Ninja with an Powered Armor. When the Ninja removed the helmet, he assumed McFist was being forced. McFist tried to play along but the Ninja wondered why somebody would force him. Since McFist failed to come up with an excuse, the Ninja figured out McFist is a Villain with Good Publicity. When Randy and Howard meet McFist at Bash's birthday party, Randy at fist spoke like he already met McFist before, forgetting that, up to this point, it was only as "The Ninja" he already met him. His efforts to mask that slip was claiming they never met before. Howard then added that McFist's stepson Bash wasn't a jerk. Randy was specifically invoking this trope in Wave Slayers to avoid having to confess the truth when the Ninjanomicon told him to fess up about what happened to Buttermaker. After expresing hope that a then six-year-old Randy never becomes the Ninja, the Ninja of 2005 quickly mentions there wouldn't be a chance anyway because the Ninja is the same Ninja during all those centuries. There Was a Door: In Got Stank?, Stanked!Bucky busts through walls instead of going through doors or even windows. The Most Dangerous Video Game: Viceroy created Jack Hammer's control as an arcade machine so that the perfect beings could control it. Teenagers, which is made worse because Howard is one playing the game doesn't believe Randy about it being this trope due to him messing with Howard's head at the arcade. Time Machine: McFist had Viceroy build one in "Randy Cunningham: 13th Century Ninja". To Viceroy's disappointment, instead of using it to destroy the Ninja, McFist wanted to use it to travel back to a time, when his favorite breakfast cereal hadn't been discontinued. Timey-Wimey Ball: Randy Cunningham: 13th Century Ninja follows this to a T. When the past was altered so the Sorcerer's imprisonment never happened, it got the Sorcerer free but didn't change the world in any way that reflected the damages he would have caused during eight centuries of altered history. No explanations were given. Title Drop: in Debbie Meddle; complete with Aside Glance! Toilet Humour: but arguably not the gross kind. They tone it down in Season 2. Totally Radical: It's hard not to find it charming in a dorky way though. Ugly Guy, Hot Wife: McFist and his wife, Marci. Unobtainium: Viceroy invents a Time Machine that is fueled by hardtogetium. He cannot get more fuel than needed for a round trip. Unusual Euphemism: McFist's stepson Bash uses the phrase "make a Mr. Grumpy" to refer to defecation. Unwanted Assistance: In Escape from Detention Island, Randy as both himself and the Ninja tries to help the students with their punishments but the Disciplinarian considers it cheating and amps up the danger making it worse. Even the Nomicon was trying to tell him he should have stayed out of it from the beginning. Villain Possessed Bystander: The Sorcerer has the ability to "Stank" any person that has been heartbroken or is going through emotional trauma, and transform them into a monster. Villain with Good Publicity: McFist. Vomit Chain Reaction: How the "candy zombies" from Night of the Living McFizzles were defeated. Wake Up, Go to School, Save the World: Less "Save the World" and more "Save the school too." Though, to be fair, if the school isn't protected, the Sorcerer will probably be able to break free of his prison and... Well. Wham Episode: Randy Cunningham and the Sorcerer's Key revealed that Randy will be the ninja to partake in the final battle with the Sorcerer. Snow-Klahoma! Randy inadvertingly lets out Anti-Julian from the Shadow Dimension who no doubt will be after the Sorcerer's Ball he has hidden away. What's more the real Julian is stuck in the Shadow Dimension. "What Do They Fear?" Episode: Viceroy once invented a robot that created personifications of people's fears. Randy fears chickens (McFist and Viceroy were disappointed); Heidi Weinerman fears looking like her mother in the future; Viceroy fears the kid who used to bully him at school; McFist fears clowns; and Bucky is afraid of minotaurs playing smooth jazz. Who Wears Short Shorts? : In The McHuggers Games, McHuggers, a McFist product Randy stole as the Ninja, is the item of interest of the episode that Randy learns that it is wrong to steal even from his enemy. Why Did It Have to Be Snakes? : Randy has a fear of chickens (Also roosters). Will Not Tell a Lie: Randy, according to Howard. Zerg Rush: Robo-Apes usual tactic when fighting the Ninja. This actually becomes effective when they go berserk and attack everything else, rendering Randy unable to stop all their rampages.